Rush 3/3:Another initiating skill that grants you counter attack buff, including a mini stun at lv 3. This skill is useful for chasing or initiating a combo. One-handed mastery 5/5:A passive skill that increases your physical power. Maxed it out as you will just swing with your sword normally and using your swordmanship skills. Comeback 1/3:Probably most useful for this build however we don't need to max it as we will have atleast 1 healer in the party for bosses. You are suppose to be good at blocking and dodging but this skill is just for emergency. Piercing strike 1/3:A debuff skill which is a fast slash that works perfectly well for this build as we prefer quick and fast dps. However leaving this at lv 1 is because it's hard to stack the debuff 3 times. Considering that it does not stack with other defenders piercing strike if they are in different levels. I.e. Defender (1) uses piercing strike 1, defender (2) uses piercing strike 3 = the PS1 effect will be overwritten and there for useless. However it may stack if both defenders has the same rank and could be helpful however it's hard to keep track on the debuff time. Rapid Assault 1/3:We leave it at 1 as we just want another stun/CC skill to hold mobs as it can hit multiple enemies that are front of you. Maxing this out only gives you additional 1 second which could be helpful with the cooldowns of your other skills. Fortifying shout 3/3:Probably the best buff in Alpha but slightly good in Beta. The changes was maximum health in Alpha and now Stamina recovery in Beta. However our party members suffers a lot of stamina usage if they keep dodging around. This will counter it by giving them more regeneration. 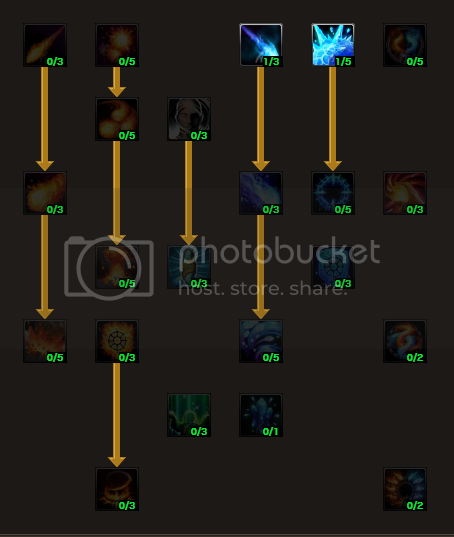 This is helpful for ourself as we skip all other slow skills that either consumes your counterattack buff or isn't really helping much in PvE situation. Defense mastery 3/3:Maxing this out gives you more successful block which means no damage at certain points when you block enemy attacks. Chaos Strike 3/3:The only skill that doesn't use any stamina, and that recovers your stamina. This is a great combo skill with the piercing strike which causes it to swing twice really fast. The reason I maxed it out is because of the no stamina skill usage and the stamina recovery from it. Shield Slam 1/5:It's a good skill that generates aggro. Leaving it at 1 should be enough as it doesn't increase the aggro bar(Untested, someone could verify if lv 2 will take aggro away from lv 1). Encourage shout 1/3:This is just spent to unlock the lv 35 skill and shouldn't be attached to the actionbar. Resilience 2/2: Probably could skip this but since I'm going to block a lot this helps me to regenerate my stamina. Evasive strike 1/1:All dodgeable skills are suppose to be spent as this skill breaks the knockdown and grants your counterattack buff. Threaten (Lion skill) 1/3:Having level 1 as we can't get lv 40 to level it more. However this is an AoE skill that causes mobs to focus on you for 3 seconds as it reduces their movement speed and damage reduction by 30%. Helpful if you plan to AoE grind or clear a room of mobs. Retribution (lv 35 passive skill) 2/2:This skill is passive as it grants you bonus damage by 10% upon successful block for your next attack and movement speed for 8 seconds. Ice arrow 1/3:This is used for pulling mobs aswell as chasing/harassing enemies. Ice thorns 1/5:A close ranged skill that grants sub zero effect which slows the enemy down. Works great if you are out of stamina and to chase enemies. It's an AoE frontal effect which is instant cast. A:It's our first AoE threat skill which causes enemies within 6m to focus on you for 3 seconds including damage reduction 30% and movement speed 30% on the enemies. Q: Why 2 points in sorcerer tree? A: Ice thorns is your catching skill to slow enemy with the sub zero effect and the ice arrow is your pulling tool including to get the first/last hit on target at distance. Q: Why no Massive Strike or Slam? A: I want to deal fast dps with the quick animation of Stunning smash and Chaos Strike combo with the counter attack buff which grants you extra damage. 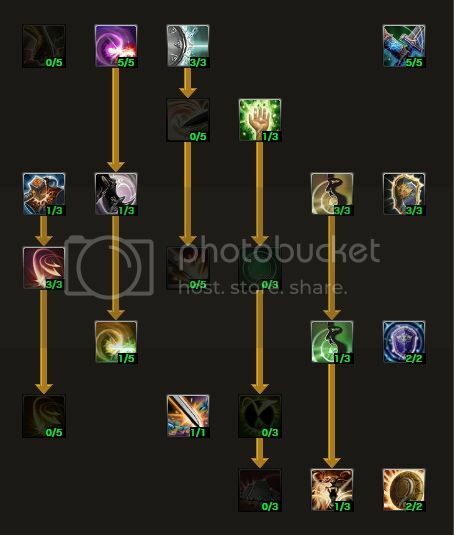 Q: Why the lv 35 passive skill? A: This skill grants you bonus damage for your next attack upon successful block and also a 10% movement speed for 8 seconds to chase the enemy. A: I've discussed this with ludique in his thread and I found my answer which sounded logic to me to not spend my point on it when it has a long cooldown and just usable for some rare occasions. Q: Why 3 points in Chaos Strike? A: The amount of stamina being recovered is fairly high and it's a quick skill to use. Piercing strike consumes 25, and chaos strike recovers 50. So you actually gain +25 stamina after these two skills. However I don't think it works if you do the skill chain which actually begins with Chaos > Piercing strike. Q: Why is it only lv 1 comeback? A: After another good discussion about comeback it's not necessary to max it out. As you have either a healer in the party. And therefor 2 skill points could go into something else. In this case maxing out chaos strike to combine my old CSF / CCF build by removing 2 points in comeback because the cooldown wasn't necessary to get shortened. Q: Why level 3 rush? A: Verified with Artule/Myrdin that this skill actually has a secret ability to deal a mini stun upon successful rush hit which makes you able your combos. Points are added to cover up the empty skill points at early level. Q: Why lv 3 shout? A: This is a PvE focused build by having quick slash skills and attacks. We only consume our counterattack buff for comeback usage and therefor shout is probably the only skill that is helpful incase we run out of stamina. But this is also helpful for our party members if they use a lot of stamina to dodge which cost roughly 30 stamina per dodge roll. Q: Does the lion skill share cooldown with the other shouts? A: No it doesn't share the cooldown.